Ontario Campaign 2000 releases its 2017 annual Report on Child and Family Poverty on Tuesday November 21 at Queen’s Park in Toronto. 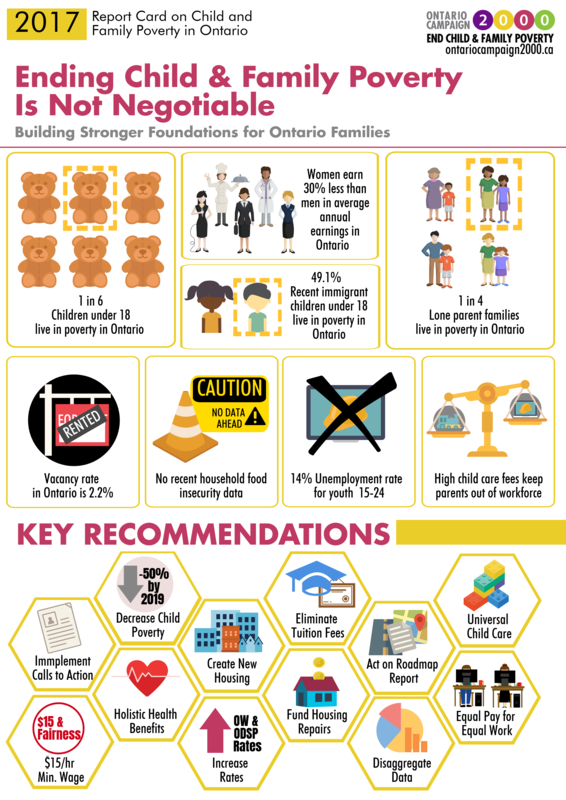 Ending poverty for Ontario’s children and families must be a key platform for all political parties heading into next spring’s provincial election. The report calls on all parties to provide concrete poverty reduction initiatives within their 2018 platforms and outlines a comprehensive plan for eliminating child and family poverty across the province. 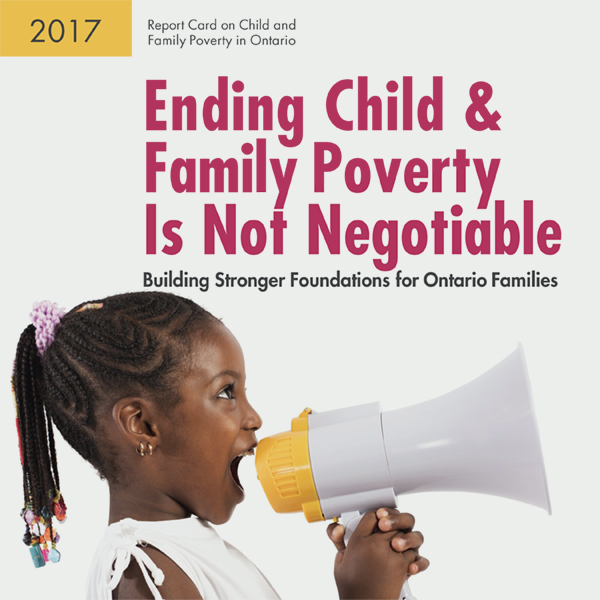 The report entitled “Ending Child and Family Poverty Is Not Negotiable: Building Stronger Foundations for Ontario Families” states that one in six (17.2 per cent) of children under 18 live in poverty in the province, with higher rates experienced by children who are Indigenous, racialized, recent immigrants and for female lone parent families. Read our media release in full in English or French. On the same day, Campaign 2000 releases its national report card along with report cards from several Campaign 2000 provincial partners in Vancouver, British Columbia; Regina, Saskatchewan; Winnipeg, Manitoba; Halifax, Nova Scotia; Saint John, New Brunswick; and Charlottetown, Prince Edwards Island. The press release, infographic and new report cards can be found in the links below.